People born specifically on the 7th of April are believed to be highly sociable with a warm heart and less ego and more understanding than most rams. The astrological planet that rules this particular day is Neptune adding innovative brilliance, receptiveness and charm to your personality. If you have this birthday your naturally diplomatic, versatile and supportive nature likes to help others. You possess a very realistic view of the world and tend to prefer and appreciate the simple things in life. Your determined temperament believes in fairness and justice. You like to be a leader or winner but may also be impatient with a bit of a temper. Fairly intelligent, you are responsive, with creative thought and often especially sensitive to the positive and negative energies. Individuals with an April the seventh birthday are enthusiastic, reliable and energetic in addition to having an independent streak that seeks occasional solitude. Work to a person born on the seventh of April usually needs to be something that provides an above average income and satisfaction. You hope to feel valued when working and generally aim to climb to the top of your chosen profession. Your diplomacy sees you drawn to political based positions while versatility makes you capable of high achievement in a wide range of different careers. The receptive consideration and kindness you show others sometimes also directs your choices. Whatever job path you decide to follow is destined towards the possibility of great accomplishments if you are motivated enough. For an Aries, the person born on the seventh day of April is typically idealistic yet immensely caring and generous concerning romance. Your concern for others gains you a big circle of friends and ordinarily no shortage of admirers in your social life. You are inclined to be sensitive emotionally and feel deeply inside causing you to react badly to love disappointments. Your idealisms can lead to unrealistic expectations initiating jealousy, moodiness, suspicion and taking things too personally. Communicating in a personal relationship is particularly important to you so an ideal partner should supply both physical and mental stimulation. A soul mate must also understand and accept your straight to the point outspokenness and have the same degree of independence. In a long term relationship you are a sensual, perceptive lover who is extremely devoted. Ill health experienced by those born on April 7th is uncommon due to your likelihood of possessing a robust constitution. Although you are active and have a mainly sensible attitude to healthiness a tendency to put your body under undue pressure can sometimes cause issues. You are likely to once in a while take well being for granted but are unlikely to ignore troublesome symptoms. Exercising on a regular basis and avoiding spicy or fatty foods should help keep you in good shape. Learning more patience could also prove highly beneficial to your overall emotional state by keeping stress levels low. The strongest parts of your character are revealed in the qualities of positivity and liveliness you express. Your gifts of imaginative caring thought, sociability and supportiveness leaves you rarely short of companionship. These favorable traits assist you to make your mark in society and inspire and motivate those around you. 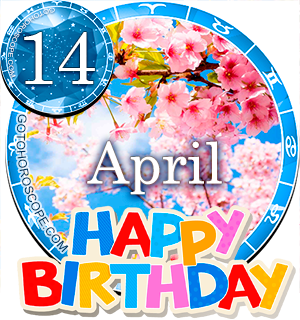 Personality weaknesses apparent in those born on April 7th are your tendencies to every now and then be unintentionally irritable and act hastily or in impractical ways. These expressions of negativity can appear more often if you feel a tad tense or have worries on your mind. Being born on the 7th of April grants you the inclination to aim for bigger goals than most people's and the will to achieve them. You try hard not to lose sight of your main aspirations and can be highly practical when it is required. In order to realize your dreams you need to practice a willingness to wait for the right opportunities and maybe improve upon your organizational skills. People born on this specific day often dream of and wish for a loving partnership where you are understood and free to be yourself. This is frequently wished for above the acquisition of material possessions. As you were born on the seventh day of the month the Root number Seven is assigned to your date of birth. This numerical reference to your birthday has the keyword 'Mystery' possibly referring to a natural curiosity that spurs your ability to innovate. The Tarot card linked with your birthday is the 7th card in the Major Arcana, the Chariot. This representation highlights your lively efficiency and reliability. The lucky stone favored and recommended to wear for individuals with April the seventh birthdays is Jade. Wearing this green gem should increase perception, self knowledge and prosperity. The planet Mars is imagined to be the planet that is largely astrologically responsible for Aries personalities. The actual day you were born on, the seventh of April is governed over by the celestial body Neptune's influence. This combination of planetary influences make you a little bit different to the usual generalized descriptions of your star sign. Your considerate and receptive sensitivity let you get along with nearly everyone allowing you to be pleasantly easy to talk to. Your enthusiasm, reliability and lack of egotism combine to form your nice to live and work with disposition. You are usually capable of managing your proneness to irritability by not letting tensions build. A final ponderable thought for people born on April the 7th is to try not to anticipate reactions or overwhelm others with your heightened spirit and vigor. Learning to wait without getting stressed should also turn out to be advantageous. This is 100% me. Some of the key points: I am highly sensitive to positive and negative energies. I am sociable, very caring, reliable, have a warm heart and have high aims in career. In love disappointments I am highly sensitive and it affects me deeply. My lucky number has always been 7. I have been told many times I am a very understanding person. But, my preferred gemstone that I have been drawn to since my early adult life, is diamonds. I love turquoise and sea water. It's like I am a water sign on the inside (Neptune) and fire on the outside (Aries). Hmm...earlier I saw a comment saying Aries are malevolent (that in China this is not looked upon so well ) Interesting because I am Chinese. And I believe April is dragon month and a very good thing! My dark side is criticism, and easy to anger when people don't do what I expect or want them too. My good side is perseverance, I grew up around negative people, mothers and siblings from 9-19 years old, and reaaaaaallly had to cleanse the past to find happiness. I love nature and am receptive to its power to give me so much relief in stress, and tensions. THe part that is true is I am unorganized and can be more tidy, about practical things -- bills, laundry, house chores. I would rather spend my time doing something social or enjoyable, or even learning. Fate choose for me, since I believed when I consciously chose some one -- that person was bad for me. I believe in the power of spiritual support and believe we are all guidede to move towards a healthy soul, and development, and that it is a daily process to work through our selves, the negatives, and such. I am very sensitive to negative energy, and learned from my dog to go around it, whereas in the past I like to walk right through it, naive that it won't harm me. I use to place myself with negative people to see what I could learn, by engaging with them. NOw I believe the best way to deal with them is to ask them questions and wait for their repose, and evaluate what I learn and instead of sharing now with the negative people how they could be better, I learned to not help them because they don't appreciate me or this help. And yes, is m very friendly and can proudly talk toooo aaaaanyooone such a blessing ! Aries carries the meanings of malevolence, cattiness and mystery, as well as acumen and divination. In some places, people believe that an Aries found in their court can bring delight. However, in most cases, this sign is considered evil, which scares people from the bottom of the heart. There are some idioms in China indicating the danger of this sign, for example, once bitten by the Aries twice shy of ten years. Speak for yourself. I hardly think April 7th is a malevolent birthday. If you even read this article and agreed with over half of its posits, then you would disagree with yourself. For lack of a more apt phrase, "haters gonna hate." Aries carries the meanings of malevolence, cattiness and mystery, as well as acumen and divination. In some places, people believe that an Aries found in their court can bring delight. However, in most cases, this sign is considered evil, which scares people from the bottom of the heart. There are some idioms indicating the danger of this sign, for example, once bitten by the Aries twice shy of ten years. Ok Mr. "this is me Aries carries the meanings of malevolence, cattiness and mystery, as well as acumen and divination. In some places, people believe that an Aries found in their court can bring delight. However, in most cases, this sign is considered evil, which scares people from the bottom of the heart. There are some idioms indicating the danger of this sign, for example, once bitten by the Aries twice shy of ten years." it is for people born in the year of the snake. Once SNAKE bitten twice shy of ten years make more sense. So it maybe you but its not me. Aries carries the meanings of malevolence, cattiness and mystery, as well as acumen and divination. In some places, people believe that an Aries found in their court can bring delight. However, in most cases, this sign is considered evil, which scares people from the bottom of the heart. There are some idioms indicating the danger of two zodiac signs, for example, once bitten by the Aries And Taurus the twice of shy for twenty years out of both of those signs. I'm month of the Aries! Considered evil which I know how to scare anybody! GEE I LOVE DIAMONDS...bigger the better.....JADE seriously???? you have nicely described me 100%. what do I do about being impatient? I also tend to be loved by beautiful a bit old ladies. Doesn't meter. If you are happy with them. Today is the day! I am highly energetic like the horse is!!! I am worried if it my qualities makes me single for so long. Def going to change my self.